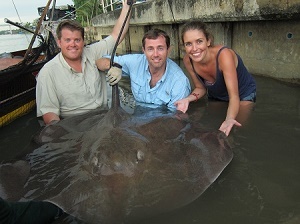 Ben and his two companions decided to add a spot of Thailand stingray fishing to their holiday in Thailand with as stingray fishing trip to the Mae klong River near Samut Songkran. The anglers started their day with an early start from Bangkok and were soon relaxing on the banks of the Mae klong River waiting for the incoming daily tide from the Gulf of Thailand. After boarding the Thai stingray fishing boat the anglers were soon moored up on a wide bend of the Mae klong River with baits placed at various intervals across the river. With the tide slowly causing the water levels to rise the river looked extremely good for some Giant freshwater stingray action. Several crushed baits were soon retrieved indicating the arrival of the Giant freshwater stingrays with the incoming tide. After fishing for the stingrays for almost two hours it was decided to move location further downstream to a previously productive fishing spot. On arrival at the new fishing area located in the Area 51 section of the river the anchor was dropped and baits were once agin placed at various intervals across the river. It was not long before a strong and determined take signalled the beginning of another Giant freshwater stingray battle with the unseen Giant freshwater stingray stripping line from the Okuma multiplier reel at a rate of knots. Winding down into the unseen Giant freshwater stingray caused the boat to be pulled round and the captain to quickly bring up the anchor allowing the unseen Giant freshwater stingray to slowly tow the boat several yards. The battle lasted a further fifteen minutes and saw Ben and his friends taking turns to try to prise the unseen Giant freshwater stingray off of the riverbed. After unclamping the stingray several times the rod tip sprang back indicated that the Giant freshwater stingray had released its grip on the bottom and saw Ben furiously winding to keep the stingray from returning to its muddy sanctuary. With the Giant freshwater stingray now in the middle layers it was now a matter of simply bring the stingray up to the waiting net attached to the side of the fishing boat. Moments later the Giant freshwater stingray surfaced angrily thrashing its tail. The guides immediately leapt into action and tightly grasped the stingrays tail before applying a bandage to make the tails fearsome barb safe. The Giant freshwater stingray was slowly transported to the riverside where it was allowed a few minutes for recovery and photography. The Giant Freshwater stingray was estimated to weigh between 60-70kg’s and was quickly released after a few trophy shots. Ben and his companions returned to the productive fishing area and continued to fish for a further hour or so but unfortunately no further takes from the stingray were forthcoming. With the tide beginning to recede the days stingray fishing came to a close and the anglers were soon back on their way to Bangkok for a much needed rest.